Very few times in ones life do you meet someone that has an impact on your life. I was lucky to have met Pat McKinley some 8 years ago and what a pleasure it has been to know Pat since that first day. Unfortunately, Pat's life came to an early end last week but what a legacy he has left us to carry on. Pat was the Godfather of the Griffon world and a major influence in the G.U.N ( Griffon Underground Network) and has been a major part in making the Griff breed as strong as it is. He always had a kind word and a witty remark that always made sense. I was able to share a camp fire or two as well as time in the woods with Pat and you really get to know the character of a man when you hunt with him. Pat was a top notch guy !! Pat was known by many on this forum. I ask that you take a moment and thank God for knowing Pat or perhaps someone else that has influenced your life. I'm sure Pat already has the dogs in the field and shooting at roosters and bobwhite up in heaven. God speed Pat !! My introduction to Pat came through my search for the best hunting Griffons and the breeders who produced them. This was probably pretty close to 12 years ago, Dec. 2003 to be exact. Griff Man introduced me to Brian White, Des Chien Griffons, who gave me a short list of three or four breeders expecting litters in the spring of 2004. Pat was on that list. Based on what I was looking for in a dog, Pat's litter seemed the closest to satisfying my needs. I wanted an athlete that could run, I wasn't disappointed. Pat and I always kept in touch and I've got a pretty good collection of photos of he and his dogs over the years. I finally got the opportunity to meet Pat face to face when I drove out to Brian's place in Prairie du Chien, to pick up a pup. It was sort of a mini, who's who, of the Griff world and I felt privileged to be there. The problem was, I never had the chance to spend the time necessary with the individuals to get to know them the way I wanted so went away disappointed. I agree with Jamie about Pat's contribution to the Griff world. I'm sorry I don't actually know in detail what that contribution was but I wish that someone who does can put it in writing so it doesn't get lost. We all owe a debt of gratitude to this great man. So very sad to hear the news of Pat's passing. Pat was a joy to be around! He shared a wonderful witty sense of humor. And a $#*! load of information. The guy is a history book of all things grif! I was lucky to hunt with Pat in South Dakota a few years back. He's one of those guys you want to hunt with. Always happy. Always humble. He seemed to enjoy others success more than his own. A true gentlemen. 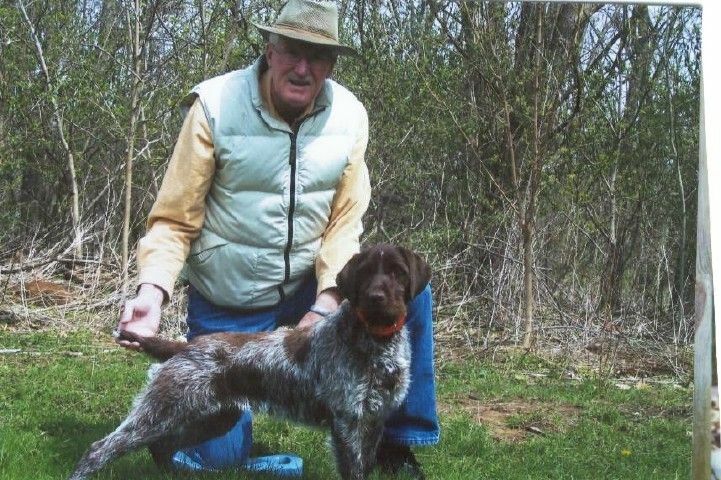 Many of us in the GUN dog world owe a huge thanks to Pat and all he contributed. I will be forever grateful. Thank you Pat! I wish your family the very best. Hunt on! There's a few grifs happy to see you. Very sad news... some folks leave a legacy behind with they leave, Pat was surely one of those folks. I'll bet there's a lot of happy Griffs in heaven's fields right now. Thank you Pat for all you've done, hunt em up with all our loving friends up there with you... you will be missed down here. Every time I do e-mails and go through my contact list, there's Pat. Wonder how long I'll keep his name there? Not sure if anyone knows but there was a nice article in Navhda on Pat McKinely and his life in Navhda. Thank you to whoever wrote the article.